Smoking etiquette is different everywhere. When it comes to smoking bowls there is one constant rule of thumb – if you are with a group, corner a bowl. Smoking etiquette is different everywhere you go. In some smoking cultures, it is frowned upon if you “puff puff” and do not pass, but in others, if you roll it you smoke it until you are ready to pass. When it comes to smoking bowls there is one constant rule of thumb – if you are with a group, corner that thing. The art of cornering is not a new trend. In fact, it has existed since the dawn of smoking pipes. Simply, when you have a freshly packed bowl in your hands and your friends are around you looking on in anticipation of a fresh taste of herb, you take special care to only light a small portion of the bowl. You can call it generosity or you can call it consideration, regardless cornering a bowl is something you should do. There is a reason people call “greens” when they are in a group of smokers. Fresh hits of “un-flamed” bowls are coveted by smokers. There is nothing like the flavor that comes from a fresh hit, and for this reason, you should take it upon yourself to smoke only what you need from each bowl that comes your way. 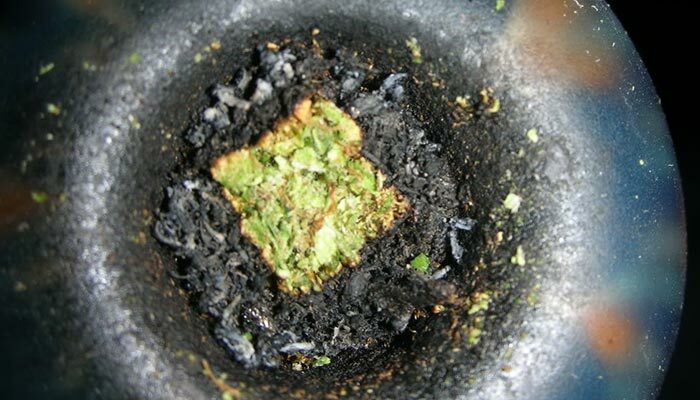 To do this, you must take special care to light only the “corner” or segment of the bowl that will take you to your high place. One way to ensure a good corner technique is to take the bowl in your hand and tilt it one way or the other. In the other hand you spark your lighter and place the flame on the edge of the bowl tilted toward the fire, as you pull on the mouthpiece, you will notice the flame is attracted to the suction. At this point, you should only be lighting a small section of the bowl, leaving the rest fresh for your friends. Another more effective way of cornering your bowls is to use a hemp wick to light the bowl. Hemp wick is a piece of hemp cord that you can light like a candle. You will have more control over the flame by using this method, allowing you to corner with precision. Another benefit of using hemp cord is that you will eliminate the possibility of inhaling butane from your lighter—another flavor distraction. Why do we get slight anxiety over being last in line to hit a bowl? Well, it’s because smoking charred bud is just not the same as a fresh hit. A huge part of smoking herb is getting to taste those terpenes. You should corner your bowls, whether alone or in a group, to ensure more fresh hits that embody the characteristics of the bud you consciously deposited in the bowl. Cornering is a gesture that will not go without thankful recognition. Be considerate, compassionate, and “corneriffic” – your friends will love you for it! Do you have any interesting cornering techniques? Let us know on social media.